Paramount’s “Thor” directed by Kenneth Branagh will hit stores on September 13, 2011. The title will be released on three types of discs including Blu-ray, Blu-ray 3D, and good ‘ol DVD. 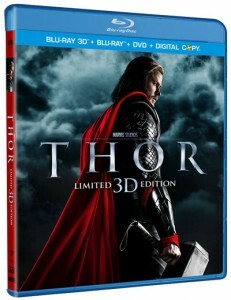 The Blu-ray editions contain over 80 minutes of additional content, as well as a sneak peak of Marvel’s “The Avengers” set to hit theaters May 4, 2012. The Blu-rays also contain a DVD and Digital Copy, which are essential for travel, mobile devices, car DVD players, etc. “Thor” on Blu-ray is presented in 1080p with English 7.1 DTS HD Master Audio (and French, Spanish and Portuguese in 5.1 Dolby Digital). The DVDs are formatted in 16:9 aspect ratio with English 5.1 Dolby Digital Surround. 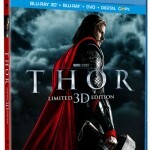 “Thor” on Blu-ray 3D, Blu-ray, and DVD is available for pre-order. The title will also be available as a single-disc DVD and in digital formats.